Texas Judge Videotaped Beating Daughter Is Suspended With Pay : The Two-Way There's also a ruling expected today on whether Judge William Adams can still have unsupervised visits with his other daughter, who is 10 years old. Hillary Adams (left) as her father was striking her with a belt. She set up a video camera to record what she says was one of many such beatings. The Texas judge who sparked national outrage earlier this month when he was seen on video beating his then-16-year-old daughter has been suspended with pay while authorities continue their investigation, the Texas Supreme Court has announced. Meanwhile, a ruling is expected today on whether Judge William Adams can continue to have "unsupervised visits with his 10-year-old daughter," the Corpus Christi Caller reports. The judge and his wife divorced in 2007 and have had joint custody of their younger child. And there's also word from KRIS-TV in Corpus Christi that an attorney is charging that the Aransas County Court-at-Law judge "created nonexistent law" and "fraudulent corrupt orders" while presiding over a child custody case. 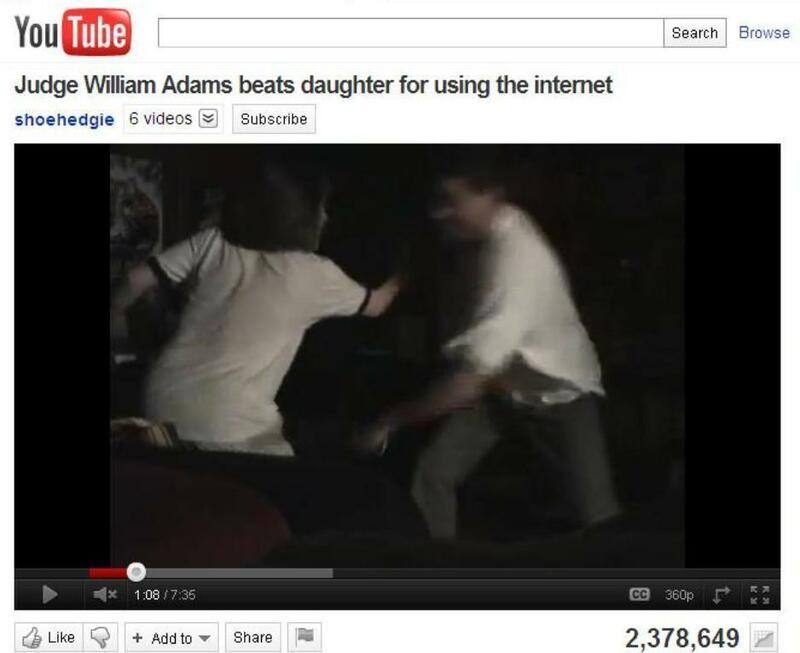 As we've previously reported, Hillary Adams (now 23) videotaped the 2004 beating and released it on YouTube late last month. It was one of many such attacks, Hillary says. She waited seven years, she says, because she was a minor when it happened. Her father, who insists he did nothing wrong and was only disciplining his child, says Hillary released the tape because she wanted to get back at him for a recent dispute over a car. As a Court-at-Law judge, Adams responsibilities include cases involving family law. The Associated Press reports that the Supreme Court order suspending the judge "makes clear that while Adams agreed to the commission's recommended temporary suspension and waived the hearing and notice requirements, he does not admit 'guilt, fault or wrongdoing' regarding the allegations."